Gray-haired and aged by war and hardship, 68-year old Rima Danielian moves with care down the edge of a bluff approaching a row of unremarkable shops in her town, Shushi. She passes children coming home from school who are growing up in a Shushi far different than the one Rima sees in her memory. Shushi today, as seen from the old mosque minaret. In fact, a decade since Shushi – on its strategic vantage point overlooking the capital, Stepanakert – was the site of prolonged and vicious fighting between Armenian and Azeri forces almost everything has changed. Rima’s memory is good and its facts well known. Before the war, Shushi had 12,000 residents. It was a beacon of culture, a center of art, of publishing and of a refined life that, if found in Shushi today, is somewhere under the city’s scarred exterior where 3,500 hang on. Roosters announce the beginning of the day in Shushi, soon followed by the ringing of bells at St. Ghazanchetsots Church – 33 clangs from the tower, one for each year of Christ’s life. The bells mark the beginning of Anahit Danielian’s working day. She sells candles at the church and says that even though most of her neighbors have nothing to do with their days, even the poorest ones come to pray; probably for a better life. “It’s true that it seems that people’s life conditions don’t change,” Anahit says. “But in recent years people have been getting married more often and it delights the heart.” It has become tradition, she says, for couples from Stepanakert (about 10 kilometers away) to come to the church for their weddings. And the occasion to have outsiders in Shushi is welcomed by owners of the little shops that are evidence of the commerce of necessity, even in a skeleton of a city. “Residents of Shushi mainly buy vermicelli, sugar, oil and cheap vodka,” says 24-year old Liana Harutyunian, a shop worker. But “buy” is not exactly the right word. “They mainly borrow,” she says. There are two bottles of champagne on her shelf, so long there that Liana can’t remember where they came from. Liana moved to Shushi from Masis six years ago with her two little girls and says that they couldn’t live and exist here if her parents didn’t help them by sending flour, potatoes and other necessary foodstuff from Masis. The bells of St. Ghazanchetsots ring 33 times every morning. Buying on credit has become a way of life that, for many, is necessary but humiliating. Stella Hakobian has seven children and receives a government subsidy for having a large family – an incentive by the State to encourage repopulating Karabakh. Stella recently was given an apartment, another perk of having the large family. She and her children have a three-bedroom flat, but the only furniture in it is beds. It is sadly funny that official statistics put Shushi’s unemployment rate at five percent. Only five percent have registered their joblessness, but Tsaghkuhi Abrahamian, a specialist at the Municipal Department of Statistics says the true number is 70 to 80 percent. 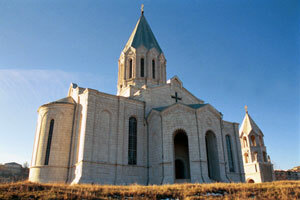 Shushi has not recovered in any comparable way with the development that has taken place in neighboring Stepanakert. And while the number of “large” families (having four or more children) is increasing in response to the State programs, the overall birth rate has dropped, officials say. City leaders say that Shushi’s future lies in finding a way to keep its young people and assure a future for them in their city. and efforts are made at providing a “normal” life that would encourage youth to stay. In fact, cultural life shows the most obvious development in Shushi. In this place of damaged and vacant buildings one can find an arts college, a drama theater, a puppet theater, a choir, a quartet, a dance group, and the list can continue. A few summers ago an arts festival was even started. 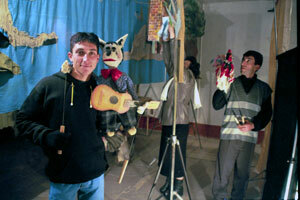 A puppet theater helps maintain Shushi’s long history of art and culture. The State Humanitarian College named after Arsen Khachatrian is the only educational option given to students from Shushi and neighboring or remote villages. The college mainly teaches various arts and crafts such as painting, carpet making, decorative art, etc. In May 2003, a technical school was renamed into the college, which, though small, is a sign of westernization in a place that seems largely detached from the rest of the world – or more connected to its former Soviet regime. 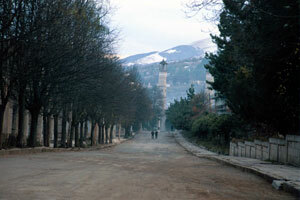 The college was reopened in 1992 after the liberation of Shushi. Today the college has 181 students, ranging in age from 15 to 23. During a recent day in the winter session at the college, students gathered to discuss the topic: “Love, Marriage, Family and Law”. Students gathered in the hall of the college, while on the stage teachers sat at a table to moderate the discussion. After a short introduction students discussed questions on divorce, on children’s rights and whether love is enough reason to get married, and looked for answers from their experienced teachers. As is often the case in small towns, the youth of Sushi and their teachers have relationships that are open and relaxed. After the day’s special program they all met to sing songs, read poetry, dance, eat, drink, then dance and sing some more. The scene, not typically found in institutions of learning, for example, in Yerevan provides a glimpse of life in Shushi. Such events are a big thing for the youngsters here. It is noticeable that the day was planned with great care, especially through the way the girls prepared themselves in their best manner. Shushi doesn't offer many opportunities, outside school, for its younger generation to socialize and even then, the events are restricted to daylight hours. When the sun goes down, activity is restricted to life inside apartments among family. A primary complaint among Shushi youth is that there’s nothing for them to do. “There’s no joy in people, especially in youngsters,” says Anna Hovsepian, age 19, explaining that since there isn’t a big choice of entertainment in Shushi, it is up to the youth to create something interesting. 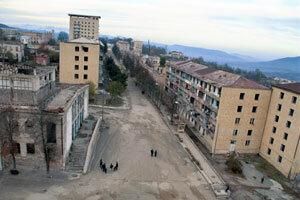 Unlike Stepanakert, in Shushi there are no cafes, bars or discos. But even if there were: “If a girl goes to a bar, everyone’s going to speak badly of her,” says 19-year old Lusine Badeyan. Especially for girls, there aren’t many options after they graduate – either they’re lucky enough to find a job, or they just sit at home, or they get married. One can't be simply hanging out with friends knowing that during that same time he could have done something helpful for the family, says Eric. Each year the college has from 60 to 70 entrants. They will graduate painters or other artists or learn some craft. But then they will go back to their villages and spend their time on something different, if not preferred, but useful. Being an artist in a remote Karabakh village is not something one could help his family with. Our future is vague, the youngsters say. And they complain that their city of rich cultural heritage is too often overlooked . The kids at the puppet theater say officials making promises to revive Shushi’s cultural life don’t seem to understand that culture is all that’s developing in Shushi. In fact the only singing ensemble in Karabakh is from Shushi (so, too, is a former “Miss Karabakh”). First a quintet founded in 2000 by girls singing in Shushi’s Varanda choir, now a quartet called Nareh have taken the thorny path of being celebrities in Karabakh. Karine,19, Alina 27, Christina 23 and Gayane, 22, have taken part in some folk and pop festivals in Stepanakert where they've taken first place. The girls are mainly performing folk songs but in a modern way. First they would travel around Karabakh and perform for free, just to become known. Sometimes they get paid today and they consider $200 ($50 each) a fair price. However they don’t always get that much. It is a long walk back to recovery, but small steps are being taken. There have been many promises, but none fulfilled so far. Future? Have no idea. Dreams? Many. For instance, Gayane dreams of going to Greece, even though she doesn’t know why. Anush Danielian, 22, says she dreams of having an Internet café in Shushi to connect youth with each other and the outside. “The only thing we do now is visit each other, but that gets old. The Peace Process: Who wants what? And when? Ten years since its last performance, the opera "Anush" returned to Yerevan stage this week. The 90-year old opera, based on Hovhaness Tumanyan's poem, was staged by Gegham Grigoryan and starred Anahit Mkitaryan in the lead role.